That headline might sound like it’s being awfully snarky—and it kind of is—but at the same time, this week Guardians of the Galaxy actually took the first baby steps from being a lukewarm repeat of a fantastic film to being a breezy, fun sci-fi cartoon. All it took was finding a little heart to do so! “Can’t Fight This Seedling” starts with a humorous twist on the old trope of our heroes having to infiltrate a low-tech society in order to liberate their object of desire—in this case, another Pandorian Crystal, the doohickey of the week for the overall doohickey of the show, the cosmic seed. Thankfully, Guardians actually realizes that this sort of thing is old hat—and instead of spending an episode with the Guardians trying to get the crystal, they trade Star-Lord’s fancy laser cutter for it in a deal that both the Guardians and the local villagers think they won. It’s short, snappy, and just the sort of goofy humor that makes these characters so appealing, and outside of limited doses, was so far lacking in this animated series. 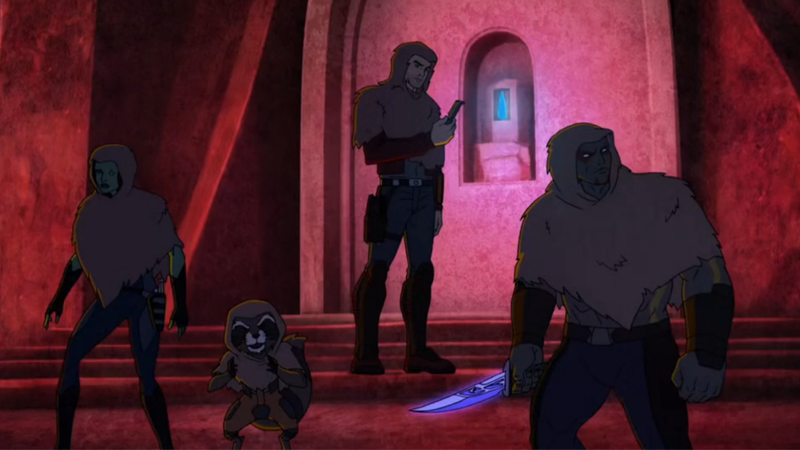 More good habits are picked up on when the episode gives itself over to the real story arc, which is about examining the way each Guardian actually sees the rest of the team and how they work as a unit. In this case, Guardians of the Galaxy largely sticks to who it knows best: Quill, Rocket, and Groot. Unsurprisingly, when it does that, it works really well. After celebrating with the villagers, Groot accidentally gets himself infected with a virulent fungus caused by the crash-landing of a nearby asteroid. It basically hulks him out, sending the poor tree-guy on a rampage that the Guardians have to protect both Groot and the villagers from—but when Rocket and Quill have to travel inside Groot to try and stem the tide of the infection, it leads to some really nicely done character work. It’s set up by having Quill be a bit of a jerk to Groot all the time earlier in the episode, which doesn’t really sit right with the show overall—a frustration at a lack of understanding between the two of them, despite the fact that we’ve seen them working together well enough already in episodes prior. But inside Groot, Quill discovers the mysterious glowing orb that Groot rescued from his lost homeworld, something shown in a short in advance of the series’ premiere. Being Quill, he manages to fall into it, and for a brief moment, actually understands Groot, where he’s come from, and that he has his own goals. Just as Quill wants to learn more about his past, Groot wants to save his. It’s hardly the most unique or surprising story arc—but for this animated series, it might as well be. From the get go, the show has struggled with doing things with these now-beloved characters that wasn’t just “Hey, it’s just like the movie!” Being able to actually explore them more outside of the limits of the film, and for the show to actually begin building up its own stories and characterizations, is great to see. It’s a baby step, but a step in the right direction nonetheless. And the fact that you actually get to see that mutual connection flourish between the two at the end of the episode is wonderfully done—and the closest Guardians of the Galaxy has actually come to replicating the feeling of the film that inspired it, instead of just endlessly trying to ape it. But at the same time, you also start to see the show struggle with what it really wants to be. You have the arc elements of the cosmic doohickey that the team are collecting Pandorian crystals for in every episode. You now have Titus, the hapless and unrepentantly jerk-ish Nova Corps officer who seems to be being set up as a regular thorn in the Guardians side (did they save the Nova Corps but in the movie? Why all the hate, Titus?). But in terms of what actually matters in the show from week to week—the relationships between the characters—Guardians seem to eschew that serialization and just change on a dime. Last week Drax and Gamora were at each others throats all the time (for no real reason), this week they’re hanging out and being best best buds. It’s strange, and sadly, it puts a real dent into the heart of this episode—Groot and Quill coming to a closer understanding with each other, and the potential of Groot having his own character arc about his lost people. But if Guardians of the Galaxy was so willing to quickly drop its setup with Drax and Gamora, will it do the same here? Let’s hope not. Exploring these characters together, and setting up stories for them beyond the event-of-the-week, is actually beginning to make Guardians of the Galaxy a lot more interesting to watch than it has any right to be.